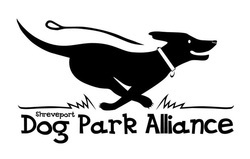 Welcome to the Shreveport Dog Park Alliance! We are excited to share the news that the dog park planned for our riverfront has been approved for the Stoner Boat Launch Facility and officially opened its gates on Friday, July 14 2017 with a Ribbon Cutting Ceremony with many two and four legged in attendance. This regional dog park is located on Clyde Fant Parkway at Stoner Avenue 2 miles south of downtown on the riverfront, inside of the Stoner Boat Launch Facility, 857 East Stoner, Shreveport, Louisiana 71101. Report park issues to shelly.ragle@shreveportla.gov or call 318-673-SPAR or message SPAR on Facebook. If needed call Shreveport Police Department 318-673-BLUE or in case of emergency call 911. Visit us on Shreveport Dog Park Alliance's Facebook page. Shreveport Dog Park Alliance was a driving force in making this dog park come to fruition and it continues to assist in its success. Visit our Facebook page https://www.facebook.com/ShreveportDogParkAlliance/ . This dog park is located in an active area of the riverfront. It's almost a 4 acre fenced area with a small dog side that is separated from the larger area, both are double gated. The larger side has rolling land, a concrete path that is almost 1/4 mile, a pavilion with 2 picnic tables (no food allowed), a pond for the dogs with benches for you to watch them, and washing stations. The facility has bathrooms, ample parking, and a beautiful view of the Red River. The dog park enhances the activities provided on the riverfront that include a skate board park, disk golf park, marina/boat launch, walking and biking trails, baseball fields, memorial areas, YMCA complex with a pool and more. The area is also used for other sports related interests. The dog park is easily accessible and adds to the parkway that is dotted with apartments, condos/townhomes, and new schools. Shopping, restaurants, and casinos are nearby. The Stoner Boat Launch Facility was built with money from the Red River Waterway Commission. The dog park adds to the project thanks to $280,000 funding from them. The Shreveport Dog Park Alliance contributed $28,000 in design money with the help from donations and fund raisers making this a public/private partnership. Others have donated to the project too. This is a public, city park and is maintained by Shreveport Parks and Recreation, SPAR. Caddo Parish helped in its creation and will provide assistance with Caddo Parish Animal Control creating a collaborative effort between the city and parish.